LAS VEGAS, NV--(Marketwired - June 02, 2016) - Family travel can be an exciting, memory-making event that lasts a lifetime. Worldwide resort network Diamond Resorts International® is a firm advocate for the benefits of family travel, which is one of the reasons most of their accommodations include family-friendly amenities including the partially- or fully-equipped kitchens, pre-planned group activities for kids, and plenty of space to relax on private balconies and patios. To help make the vacation an even more restful experience, Diamond Resorts has provided some excellent tips for parents. The family road trip is the stuff that childhood dreams are made of. However, driving long distances with young children can be nerve wracking with their limited attention spans and inability to sit still for long periods of time. 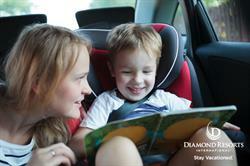 Diamond Resorts International® recommends packing toys, books and activities to keep them entertained. Music and verbal games like "I spy" are also beneficial. It may be helpful to break up the driving by stopping every couple of hours at rest stops, playgrounds or anywhere to stretch your legs and burn off some of their pent-up energy. Children can also be eased into the vacation prior to departure by starting a few vacation-related projects before the family leaves. Diamond Resorts International® suggests exploring maps together, reading history, watching a movie set in the location or perhaps trying some of the food in advance, especially if it is likely to be radically different from what they're used to eating. These pre-trip preparations can go a long way toward minimizing stress and getting them involved in the itinerary. And parents should keep in mind how vital it is to stay flexible. Trying to stick to their home sleep schedule might lead to more frustration than benefit. It is important to remember that sleeping in a new environment has the potential to be difficult for young children, thus nap opportunities should be encouraged. Parents are well aware that bringing plenty of entertainment and games when traveling with the kids is essential. Diamond Resorts International® reminds parents that many airlines allow family travelers to carry a diaper bag in addition to their regular carry-on luggage. Taking advantage of this courtesy has proven helpful and provides for an opportunity to pack many kid distractions such as sticker books, a portable DVD player, or an iPad, making sure that all devices are fully charged and equipped with headphones, to enjoy the travel for a dream vacation. Diamond Resorts International®, with its network of more than 420 vacation destinations located in 35 countries throughout the continental United States, Hawaii, Canada, Mexico, the Caribbean, South America, Central America, Europe, Asia, Australasia and Africa, provides guests with choice and flexibility to let them create their dream vacation, whether they are traveling an hour away or around the world. Our relaxing vacations have the power to give guests an increased sense of happiness and satisfaction in their lives, while feeling healthier and more fulfilled in their relationships, by enjoying memorable and meaningful experiences that let them Stay Vacationed™. Diamond Resorts International® manages vacation ownership resorts and sells vacation ownership points that provide members and owners with Vacations for Life® at over 420 managed and affiliated properties and cruise itineraries.